NO CHARGE FOR COOL TOPIC DISCUSSION but RSVP A MUST! A sell-out sized audience were educated on the current status of society's struggle with the Opioid Crisis that affects our neighbors and our families. Christine Stapleton of the Palm Beach Post shared her personal experience with addiction and her professional experience investigating sober homes. Al Johnson, who leads the State Attorney's Sober Home Task Force, reported on progress being made on sober home abuses. Helping to make the July Hot Topic presentation a success were (from l. to r.) Elayne Alvarez, Darcy Davis, Nancy Gau, Elissa Noyes, Karen Wilkerson, Andy Amoroso, Chuck Shaw, Susan Bucher, Joyce Sullivan, Lisa Gardi, Jessica Waxman, and Kathryn Walton. On Friday, July 14, 2017, Howard Goodman, Editorial Writer for the Palm Beach Post, addressed a session of Super Advocates on the art of writing letters to the Editor. While he was only scheduled to speak for about 45 minutes, he was so interesting and informative that the session lasted well over an hour. We left with a greater understanding of how to get our letters published and how they are selected. Howard Goodman (extreme left) explains the finer points of writing effective editorials to a group of Super Advocates, including (l. to r.) Michelle Dodson, Patty Whitehill, and Geoffrey Kashdan. The so-called ‘Election Integrity’ Commission, chaired by Vice President Mike Pence and Kansas Secretary of State Kris Kobach, is seeking to find potential fraudulent registration on voter rolls across the country. They’ve requested personal, confidential information from all fifty states that threatens the privacy of Americans. There is no justification for this giant fishing expedition! Stand with the League against these dangerous requests. 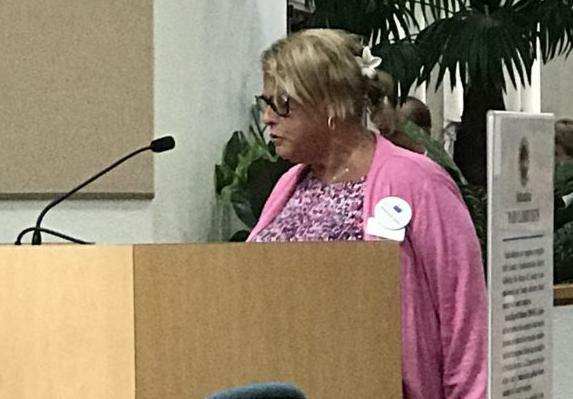 Joyce Smookler (pictured), Observer Corps Chair, read a statement on behalf of LWVPBC informing the Board of our support for restoration of voting rights for felons and encouraging all present to sign a petition in favor of our position. She also shared the news that LWVPBC is the 3rd largest league in the US. A different monthly statement, prepared by President, Karen Wilkerson, will be read at all Board & Commission meetings attended by the Observer Corps members this month. Our goal is to keep elected officials aware of our activities. A different statement will be read each month. ACCESSING ARCHIVED ISSUES OF NEWS! You can even share them with friends and family! Please help us inspire democracy by sharing these worthy messages"